From the very first, 'free act' attractions have been an important part of carnivals and fairs and are still a "must have" in every major fair today. 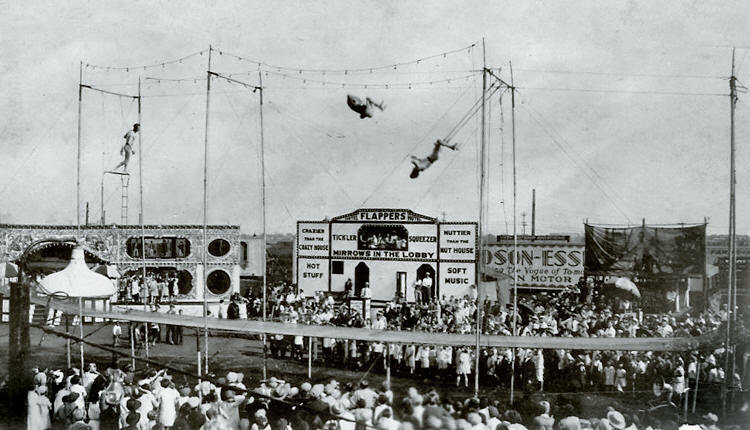 Dare devil stunt performers and circus acts have traditionally provided the free entertainment that got the folks off the couch, out to the fair and on the midway. A typical attraction will do two or three shows a day. These acts are paid by the carnival company or fair board. This is a flying act on the Johnny J.Jones midway in the 1920's during a matinee. Sadly, the names of these talented performers is lost to history.